Brock Lesnar, is currently the WWE’s Universal Champion could be set to make his UFC comeback after Wrestlemania. 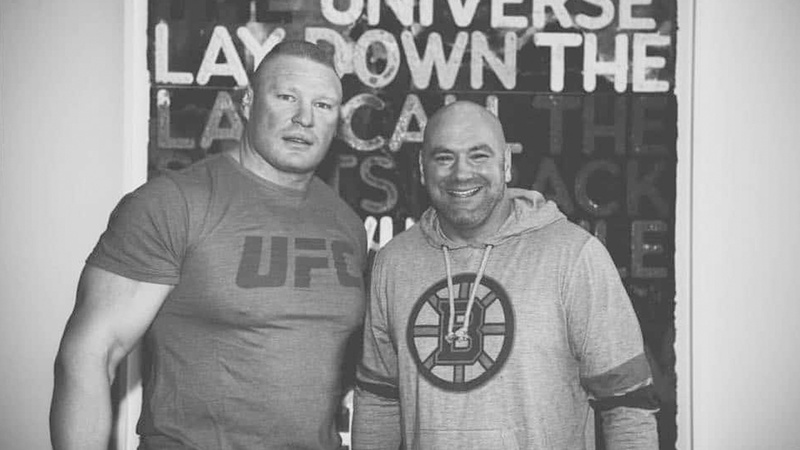 UFC President Dana White sent fans into a frenzy by posting a picture of himself with the WWE superstar and former heavyweight champion – who was conspicuously sporting a branded t-shirt. White simply captioned the inflammatory picture with a smiley face emoji. Dave Meltzer recently reported on Wrestling Observer that Brock Lesnar’s WWE contract would expire following WrestleMania 34 on April 8th. The newsletter also mentioned that there are aspects in the contract that could keep him with WWE through August and would be unable to compete anywhere outside till then. WWE Paul Heyman said earlier this week that Lesnar is ready for a UFC comeback and will fight in the Octagon again – if that’s what he wants to do. Brock Lesnar last fought in July 2016 at UFC 200, where he defeated Mark Hunt, which was ultimately ruled a no-contest when he tested positive for the banned substance clomiphene and Lesnar was suspended for one year. Right after that Lesnar made the decision to announce his retirement from MMA for the second time in February 2017. From the sounds of it, however, Lesnar could make another walk to the Octagon before all is said and done. Lesnar held the UFC heavyweight title from 2008 until 2010, beating the likes of Randy Couture, Frank Mir, and Shane Carwin before a stomach illness and tough losses to Alistair Overeem and Cain Velázquez cut his prime short. Lesnar has not yet entered the USADA testing pool. In order for him to return, Lesnar must be a part of the USADA testing pool for five months before he can fight. How many of you want to see former UFC heavyweight champ to return to UFC octagon?